The symbol ☞ is a punctuation mark, called an index, manicule (from the Latin root manus for "hand" and manicula for "little hand") or fist. Other names for the symbol include printer's fist, bishop's fist, digit, mutton-fist, hand, hand director, pointer, and pointing hand. The symbol originates in scribal tradition of the medieval and Renaissance period, appearing in the margin of manuscripts to mark corrections or notes. Manicules are first known to appear in the 12th century in handwritten manuscripts in Spain, and became common in the 14th and 15th centuries in Italy with some very elaborate with shading and artful cuffs. Some were playful and elaborate, but others were as simple as "two squiggly strokes suggesting the barest sketch of a pointing hand" and thus quick to draw. After the popularization of the printing press starting in the 1450s, the handwritten version continued in handwritten form as a means to annotate printed documents. Early printers using a type representing the manicule included Mathias Huss and Johannes Schabeler in Lyons in their 1484 edition of Paulus Florentinus' Breviarum totius juris canonici. In the modern period, the pointing hand became more popular in publications, advertising, and directional signage. Some fingerposts have relief-printed or even fully three-dimensional physical manifestations of pointing hands, The United States Postal Service has also used a pointing hand as a graphical indicator for its "Return to Sender" stamp. In modern printing, it was used as a standard typographical symbol marking notes. The American Dictionary of Printing and Bookmaking (1894) treats it as the seventh in the standard sequence of footnote markers, following the paragraph sign (pilcrow). Sherman (2005) argues that as the symbols became standardized, they were no longer reflective of individuality in comparison to other writing, and this explains their diminished popularity. 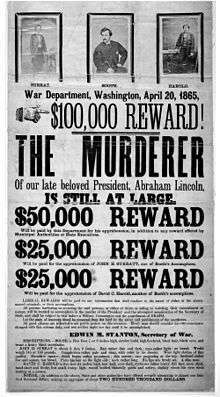 1865 wanted poster of John Wilkes Booth using index-fist character. The typical use of the pointing hand is as a bullet-like symbol to direct the reader’s attention to important text, having roughly the same meaning as the word "attention" or "note". It is used this way both by annotators and printers. Even in the first few centuries of use, it can be seen used to draw attention to specific text, such as a title (in some cases in the form of a row of manicules), inserted text, noteworthy passage, or sententiae. In some cases, flower marks and asterisks were used for similar purposes. Less commonly, in earlier centuries the pointing hand acted as a section divider with a pilcrow as paragraph divider; or more rarely as the paragraph divider itself. Some encyclopedias use it in articles to cross-reference, as in ☞ other articles. It occasionally sees use in magazines and comic books to indicate to the reader that a story on the right-hand page continues onto the next. In linguistics, the symbol is used in optimality theory tableaux to identify the winner in a candidate set. American science fiction writer Kurt Vonnegut used the symbol as a form of margin on the first line of every paragraph in his novel Breakfast of Champions. The literary effect of this was to create separation between each paragraph, reinforcing the stream of consciousness style of the text. Thomas Pynchon parodies this punctuation mark in his novel Gravity's Rainbow by depicting a middle finger, rather than an index finger, pointing at a line of text. An upward pointing hand is often used in the mouse cursor in graphical user interfaces (such as those in Adobe Acrobat and Photoshop) to indicate an object that can be manipulated. The first is believed to be the Xerox Star. Many web browsers use an upward pointing hand cursor to indicate a clickable hyperlink. CSS 2.0 allows the "cursor" property to be set to "hand" or "pointer" to intentionally change the mouse cursor to this symbol when hovering over an object; "move" may produce a closed fisted hand. Many video games made in the 1980s and '90s, primarily text-based adventure games, also used these cursors. Unicode 7.0 (2014) incorporated more indices from the Wingdings fonts. 1 2 Geoffrey Ashall Glaister s.v. "digit 2. ", Encyclopedia of the Book, 2nd Edition, 2001, p. 141. "This type ornament has a long history, the printed outline of a hand being used as a paragraph mark by, among other early printers, Huss at Lyons in 1484 in the edition of Paulus Florentinus’s ‘Breviarum totius juris canonici’ he printed with Johannes Schabeler. As with other typographic conventions this was taken from scribal practice, carefully drawn hands pointing to a new paragraph being found in early 12th century (Spanish) manuscripts. It is also known as a fist, hand, or index." ↑ Hasler (1953:4). The standard sequence of reference marks was *, †, ‡, §, ‖, ¶, and ☞. ↑ Pynchon, Thomas (2012). Gravity's Rainbow. Penguin. ISBN 9781101594650. Retrieved 2012-12-18. Charles Hasler, "A Show of Hands,", Typographica O. S. 8 (1953), 4-11. Prince, Alan and Paul Smolensky. (1993/2002/2004): Optimality Theory: Constraint Interaction in Generative Grammar. Blackwell Publishers (2004) (2002). Technical Report, Rutgers University Center for Cognitive Science and Computer Science Department, University of Colorado at Boulder (1993). Sherman, William. Toward a History of the Manicule, 2005. Wikimedia Commons has media related to Manicules.